Outside of the cotton industry, no one truly understands all the hard work that is involved in growing and maintaining cotton farms. With this in mind, Pro-Visual Publishing, along with Cotton Australia, wants to raise awareness of safety and best practice through the recent release of the Cotton Industry Guide to Safety. Cotton growers fortunately have the help of myBMP, the Best Management Practice Program, which allows for a quick and easy access to the industry’s most helpful tips and solutions. Not only do growers have to comply with the guidelines established in this program, they have to also keep in mind the harmful effects of chemicals. Hazardous chemicals pose a serious threat to the health, safety and wellbeing of people and the environment. Growers all have the responsibility of ensuring that spray applications do not impact other farms or landowners. No one wants to be subjected to health problems or even have their crop suffer, so it is important to comply with safety control measures. This will offer the best protection for all. 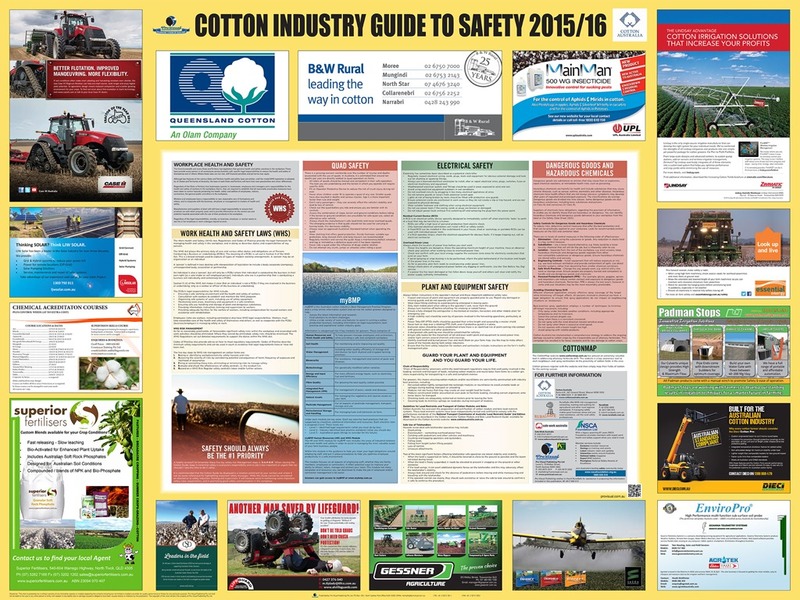 “I would like to thank all of the sponsors of the Cotton Industry Guide to Safety 2015/16. Their support has made it possible for the Guide to be distributed free of charge” – John Hutchings, CEO, Pro-Visual Publishing. Pro-Visual Publishing is the leading specialist in wall-mounted workplace health & safety, food safety & hygiene and health and wellbeing information resource Guides. Each Guide is practical and informative, providing a quick reference point for management and staff. Pro-Visual Publishing’s Guides are designed to inform, motivate, educate and above all keep people and their workplaces safe!